Since I got the tutorial I think I have done five bowls in different sizes. The description is really easy to follow. I has measurements for bowls in different sizes and also a guide on how to make it in any size you like. At the end there is also guides to make handles and inside pockets. Well in one of our cupboards we store all kinds of paper, cords, bisquits and lose bits and sticks and the mess has bothered me for a while. 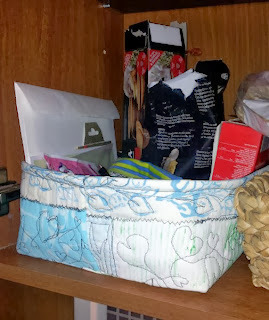 Then suddenly I realzed I could make a fabric bowl to store everything in and at least it will look better even though the mess is still there. I hade some fabric from earlier projects that were stamped and painted with fabric color and thought they would work for this. 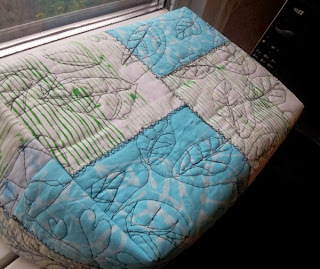 I sewed scrap pieces onto some backing in a technique I learned from an online class (yep!) by Alisa Burke and her book Sew Wild. I took some measurement on my cupboard and constructed the bowl based on them. I think it turned out ok and I'm happy with it. The quilting actually turned out better on the bottom of the bowl. I usually don't over think or plan my projects too much so this typically happens... Oh well. This is how it turned out in the cupboard. And here are two others I've made earlier. I like it when I can make practical use of the things I do. 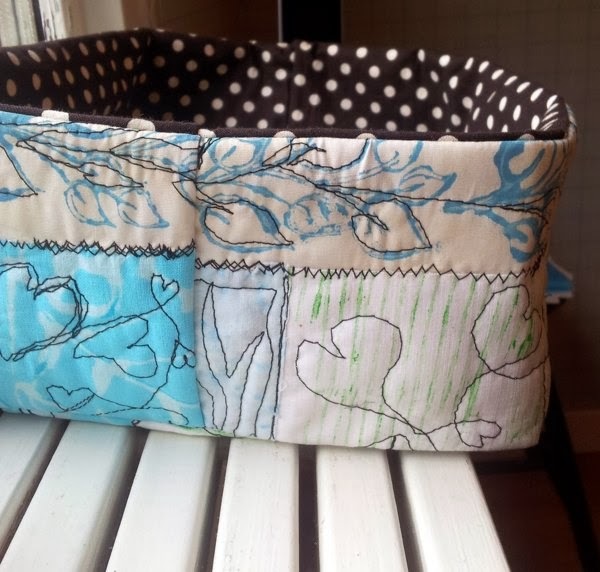 I loved to paint and print on the fabrics and I could do that forever but I don't like to stock it up not comming to real use. 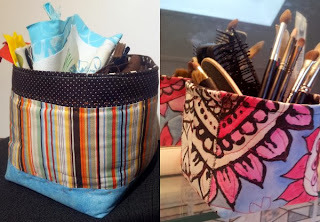 That is why these fabric bowls are so great. But I only make one if I have a purpose for it... Well maybe not always but I strive for it. How about you, do you have the same hang up on putting things to use or do you just make stuff for the pleasure of it?